The detox is over, I can tell you it was difficult not to be tempted and blog or check email, the inbox is overflowing. It was an interesting longish weekend full of surprises . But that is not for publishing. On the other hand I discovered that someone is so keen to understand my ramblings that they went to the trouble of translating some posts- yes yes - ( nodding my head up and down) check it out here 'from the rock' in Spanish De la roca sounds already nicer ;) . I'm honestly flattered thank you unknown reader. I was contemplating stopping the blog but when I saw this I thought that maybe it was still worth it to blog, plus Robert of Wired Temples has also argued against it hmm , maybe I should set up a vote ? Anyway today I would like to remember Salampax who had inspired me, Raed who got really excited about the idea of a Libyan blog , Zeyad from Healing Iraq who convinced me to go public with his skillful persuasion and actually launched my site around this time last year( thanks Zeyad may you always be safe)- by the way he's blogging again everybody ! And last but not least is Iraqi Spirit who kept encouraging me despite my frustrations ( my thoughts are with you ). There is one more person in the shadows, he knows who he is :) , I salute you my friend : do you think your 'little student' is growing up finally ? ( you can answer by email ). While I'm at it I'm glad to note that I found some more blogs from Libya , yippee , Alea, teaches English in Tripoli and has set up a blog for her students to interact in, go check the level of English of these students, wow I'm impressed, these will all be potential bloggers ;) . It's fun, with photos of Libya, of the Yathreb school , of Alea and her class, read their homework etc.. now if only our non-Arab friends could learn to write and speak Arabic just as quickly and as good as these Libyan kids...(sigh). Another teacher is blogging bilingually here at permanent movement watch and read her diary and see her kids and other Libyan kids & their friends just in ordinary normal life to get the feel of Libya . Salah El Din at Unfettered Swallows is a student in Oklahoma, his blog is artistic and metaphysical and he's got some lovely photos from his trip to Japan as well. A big welcome to the blogosphere to all of them. I'll keep on adding more when I stumble on them. Update Two 25/3/05: HAPPY EASTER to ALL of you ! 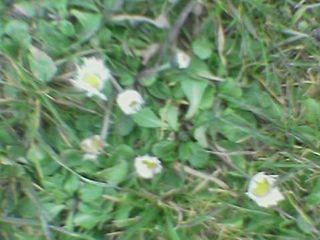 Spring is in the air: the first daisies ? I'm taking a few days detox from internet and blogging, I'll meet some friends and be a real person again ;) not just a virtual Highlander. Please feel free to comment and discuss about your addiction or non addiction to internet or any other subject or even prepare something you've always meant to ask me. Maybe after this little break I'll be more refreshed to tackle your questions. Have a wonderful time! Sandmonkey is putting down his foot ;) regarding comments section,. That was a nice rant; made a lot of sense. I'm replying here because I can't access your comments section either, Blogger is doing crazy things again! So just to clarify a few points I am Libyan ( told you that many times on your blog ;) - & yes like you I LOVE Lebanon also, basically we agree on many points. More Libyan and Libya related blogs! Khadija is an American married to a Libyan guy! You will definetely enjoy her humourous take on the Libyan society. Libya's population is so small that I have probably run into her on many occasions . Khadija has been blogging since September.You can see her views on plumbimg in Libya , the adventure with the kids and cat and hubby...some great photos of her travelling around the country etc..: "Mustafa went out to find the perfect sheep for Eid. Eid is gonna be on Thursday, and we've been getting ready. They always jack the prices of the sheep up this time of year 'cause they know you've got to buy one. So Mustafa's been grumbling about things (he'll never admit to be grumbling about the sheep - just takes it out in other ways)." Tripoli Girl , is a Libyan teenager, she's Khadijja's daughter, go cheer her on and help her improve her English ( as her mum wishes) , though I think her English sounds very good to me, welcome Tripoli Girl you're our future. At Discarded Lies [ who has cool blog ] I came accross this article by Peter Wilkinson of the New York Times who travelled to Libya a few months ago ....Here are excerpts or just click on the link for the whole report. It's difficult to think of a place, in our 21st century, left to pioneer. For Americans, right now, that would be Libya, a complicated and confounding land on the North African coast, opened in February after 23 years of a travel ban tighter than Cuba's. As we toured Tripoli's medina, a brief walk from the hotel, I was struck by how refreshingly tranquil it was. This was not your typical Middle Eastern souk, a riotous, rattling, sputtering engine of commerce and emotion. A few children set off firecrackers in the street. Cascades of sparks poured from a metalworking shop, where men smoked silently from hookahs. But there were no hordes to elbow, no hard sell, no streams of beggars, as there are in Cairo. ''I've traveled all over the world and I've never been so frustrated or had such an excruciating planning process for a trip,'' said Alexandra Watkins, a copywriter from San Francisco. Nonetheless, she is among the hundreds of Americans who are signing up for group tours to Libya. Looks like Peter had fun, unlike Michael J. Totten about whom Khadijja says : " The pictures on his blog are interesting, but beware! He's a bit negative and not so accurate in his facts about Libya. God alone knows what kind of tour guide this guy had!" 'Trigger happy ' in Baghdad, one too many..
Was the killing by US troops of an Italian security chief and the wounding of the Italian journalist he had helped release hours earlier an unfortunate tragedy? Or was it something more sinister? Either way, Washington has some tough questions to answer. American military sources in Baghdad maintain that the car carrying journalist Giuliana Sgrena and three Italian intelligence officials, including the slain officer, failed to react to repeated instructions to stop at a roadblock just outside the capital’s airport. It seems extraordinary that Italian intelligence professionals who had just rescued the journalist would have been insensitive to the requirements of a security check and the risks of ignoring it. One possible explanation for the attack on the car carrying the Italians is that trigger-happy US troops, terrified of car bombers, fired the minute they suspected the vehicle was a danger to them. It only takes one nervous soldier to shoot a single bullet and a whole unit then shares the panic and opens up on a target. If this is what happened, then it is a demonstration of the indiscipline and poor training of US soldiers which has in the past resulted in a number of similar attacks, including the slaying of the Iraqi occupants of a car rushing a pregnant woman to a maternity hospital. The odiously named “friendly fire” has characterized the US military performance in Iraq to the fury of Washington’s allies, not least the British whose troops have discovered that however “friendly,” it can prove as deadly as the unfriendly variety. There is, however, the more sinister explanation which is that the Americans wanted Sgrena dead. A senior correspondent for the Communist daily, Il Manifesto in Rome, the journalist has been no friend of the US invasion and occupation. US troops have killed journalists before. Two cameramen, a Ukrainian and a Spaniard, were slain in April 2003 when a US shell was fired into the Palestine Hotel, a known base of international journalists opposite the Baghdad Sheraton. Earlier an Al-Jazeera correspondent was killed when the TV station’s local office was struck by a US missile. The American military has not taken kindly to foreign journalists who refuse to involve themselves in America’s well-oiled media-relations machine. When Sgrena was kidnapped on Feb. 4, other journalists were told by US officials that the event highlighted the danger of working outside their Green Zone-focused loop. There was also apparently grim satisfaction that a journalist who was so opposed to US policy should have become a victim of the insurgents. The conclusion of the sinister explanation must therefore be that the Americans were settling the score with a foreign commentator whose published views infuriated them. Yet it seems incredible that even the American military could be this crass. In Italy, the incident is provoking a renewed outcry against further Italian involvement in Iraq. An anguished Berlusconi reportedly made an extremely angry phone call to President Bush and was promised that that incident would be fully investigated. The journalists group Reporters Sans Frontiers is demanding, however, that an independent inquiry be mounted by the UN since the group fears that, as with the Palestine Hotel deaths, the US will again exonerate its trigger-happy troops. Any ideas on that or is it really just an accident? I permitted myself to post the whole article by Soumayya Ghannoushi who is a researcher in the history of ideas at the School of Oriental & African Studies, University of London; in the hope that you will read it to the end. This is what many people from that area [Middle East] think (not neccessarily my opinion), to reach them and show them the sincerety of the West and Bush's plans in meddling in their affairs you may have to consider a 'different' approach then villifying their religion, humiliating them at every turn and destroying their homeland by continuous interventions. ; so that eventually they can turn to their own projects of reformation and democratisation with all that it entitles. Ok enough blabbering here is the article . "Ever since the monumental day of 11 September 2001, the world has been inundated by stale cliches and dim-witted myths, poorly disguised as honest academic research and free, objective journalism. In this great hyperbole, the world appears broken into two opposite trenches: a sphere of freedom, morality and civility, confronted by its antithesis: an enslaved barbaric realm that encapsulates all that "we" are not. The far-stretching lands of Islam loom largely in this bleak uncivilised sphere. If the modern West is dynamic, the world of Islam is stagnant. If it is governed democratically and honours self-ownership, Islam is plagued by a despotism that crushes the individual altogether out of existence. If it is rigorously rational, the world of Islam is the embodiment of raving instincts and wild emotionalism. This discourse, which derives its roots from the tradition of Orientalism responsible for rearticulating and institutionalising the enormous arsenal of mediaeval Christian terms, narratives, images and myths about Islam and its world, had been severely undermined by the waves of Third World national liberation movements and the ever-growing tradition of post-colonial studies which question the essentialism and readymade models asserting the uniqueness and cultural purity of the West as opposed to the East's backwardness and stagnation. With the dramatic events of September 11, however, this discourse was able to rear its ugly imperialist and colonialist head once more, reformulate its postulates and recycle its old stereotypes of Muslims, their world and faith. What had 30 years ago been cause for embarrassment and disrepute, was once again restored to normality, even respectability. Muslims thus found themselves the object of incessant condemnation and vilification. When it comes to the subject of Islam and Muslims, even the most elementary requirements of responsible objective scientific research could be dispensed withWhile not even the weak, marginalised Muslim minorities in the West were spared, the world powers that reign over the destiny of the Middle East and the greater part of the Muslim hemisphere assumed the role of the innocent victim of "Islamic aggression", who bore no responsibility whatever for the tragic crises of the region, from war, chaos and occupation to economic backwardness and political despotism. Even those of little if any knowledge of Islam and its intensely complex historical condition, movements and traditions now entered the unrestricted open market of Islam. When it comes to the subject of Islam and Muslims, even the most elementary requirements of responsible objective scientific research could be dispensed with. We have thus become used to seeing parts of Quranic verses extricated from their contexts and combined with other fragments to distort the general meaning, to hearing Quranic verses confused with sayings of the prophet and talk of otherworldly punishment and reward represented as rules determining treatment of non-believers in this world. And daily we bear witness to the hideous spectacle of ignorance, arrogance and prejudice parading freely across the larger part of the countless analyses, columns and articles on Islam and its world that stretch across pages and pages of newspapers, glossy magazines and academic reviews. The 19th century European travellers' distant detached observations of the strange ways of the Muslim other, the Christian missionary, colonial administrator and military generals' representations of the remote world of Islam, are now replaced by ones by journalists, Islamologists and so-called experts. The distorted and confused conception of the Islamic faith and historical experience these hold finds its roots in three elements essentially. First, a recycled Christian memory of Islam that remained active even in the era of secularisation. The mediaeval Christian view of Islam as a deviant heretical creed continues to survive within a "secularised" framework. For although Christian theology has lost the vanguard role it had enjoyed during the Middle Ages, its content has been largely stripped of its transcendental character and rearticulated within a modern essentialist philosophy. Secondly, the shift in the balance of power in favour of the modern west and emergence of an international order that gave the upper hand to the European powers over the rest of the globe, mainly in the south Mediterranean hemisphere. And, finally, the deep crises and high level of political disintegration that accompanied the accelerated decline of the Ottoman Empire and, since the beginning of the 19th century, came to characterise the whole Muslim world. These three interconnected factors gave the modern west leave to silence Islam's voice and impose itself as the unique power of logos, of understanding, revealing, categorising and modulating Islam and its societies. Since culture is an easy target, readymade postulates and categories are constantly invoked to explain all the ills plaguing the Muslim world. And it is precisely through this gate that thinkers with little acquaintance with Islam have engaged in a polemical discourse on Islam overwhelmed with superficiality, generalisation and distortion. But beyond the superficial cultural explanations behind which hide western elites and decision makers, how can we make sense of the crises that dominate the scene in the Muslim world in general and the Arab region in particular? Could we dissociate the current condition of this sensitive part of the globe from its active near past, from the colonial policies and foreign interventions that still dictate much of its fate? Could we separate the region's situation from the mammoth structure of a world order governed by great powers headed by the American giant, which reign over the destinies of the people of the Middle East? If we are to gain insight into the grave phenomena emerging in the Islamic world, we must begin by freeing ourselves of the blind, naive essentialism characteristic of a great many analyses of the problem, which seek theological explanations for highly complex historical phenomena. The intensely intricate nature of the Islamic socio-political situation marked by striking contradictions and strong tensions is better understood when viewed within the context of the waves of Western imperialist expansion, of the crises of the post-colonial state and the reality of social deprivation, economic dependence and decadent educational systems unable to fill the vacuum generated by the erosion of traditional learning centres, along with the marginalisation of the Muslim masses from the political system. The situation is further complicated by American foreign policies in the Middle East, its backing of Israel's military occupation of Palestinian land and shameful military occupation of Iraq, which according to the most modest estimate available, has resulted in the deaths of over one hundred thousand Iraqis and wrought havoc in the country's infrastructure. The countless innocent Iraqi lives it wrecks and the enormous American resources it devours (a colossal $240 million) are in the eyes of the architects of this latest of America's colonial ventures, justified by the underlying aim: imposing military dominance over this country, thereby laying hands over its enormous oil fields and subduing the entire strategic Arab region to American hegemony fully. Only the terminally naive and politically blind may, indeed, be duped by the heroic rhetoric of bringing freedom and democracy to Iraq and the region. If anything, the US is widely regarded by the majority in the Middle East as a crucial obstacle in their struggle for freedom from oppression. It is interesting that the most despotic states in the Middle East region are those who have the closest ties with the US and its Western allies. One, indeed, may legitimately ask if such totalitarianism is the product of Islam, or whether it is the creation of Western policies themselves. It is to the West's hegemonic self-engrossed policies and bleak historical record in the region that we should turn if we are to understand the causes of the great turmoil shaking Muslim societies to their very depths. Indeed, much to the horror of the journalists and intellectuals acting as the "enlightened missionaries" of new colonialism, it is America's statesmen, generals and moneymen that hold the key to our search for the origins of "Islamic" fanaticism and extremism, not the texts of the Quran or the tradition of Islam's Prophet as they never tire of repeating. What of the expressions of fanaticism in the Western "free" world itself? Where are we to classify yesterday's brutal totalitarianisms of the likes of Nazism, fascism and Stalinism and today's ascending extreme political right? Could Le Pen of France, Jorg Haider of Austria or the deceased Dutch rightwing politician Pim Fortuyn be described as by products of the mighty western modernity and its sublime cultural values? If that is the case, then a process of cultural reform would seem to be even more urgently needed in the west, since unlike the elements emerging from the shadowy impoverished and powerless Muslim world, these rising forces have at the service of their fanaticism, once in power, a staggeringly potent military machine that threatens to bring death and destruction to much of the globe. Once more, the keys to world peace and stability it seems are in the hands of the "enlightened free world", not in the realm of darkness and decadence that stretches across the rest of the globe; in Washington and London not in Baghdad and Gaza."